UPDATED 3:38 P.M. ET (U.S.A.) A 52-frame slide show accessible online may lead to questions about whether the privacy of Walmart customers and Walmart itself has been invaded in a sales promo for the purported MPB Today “grocery” program. At least nine of the slides show customers, including people who appear to be senior citizens, shopping inside a Walmart store. The promo also appears to capture the images of Walmart employees. Fifteen photos of various Walmart departments are displayed in the presentation. 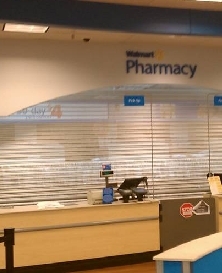 One of the snapshots taken inside the store includes the image of a woman standing inside the pharmacy section. The woman appears to be holding a cell phone to her left ear. The snapshot is dated Aug. 28, 2010 and time-stamped at 13:47. It is unclear if the date and time reflect the actual date and time the photo was taken. Several of the photos in the promo are date – and time-stamped. It is possible that all of the photos displaying Walmart shoppers, employees and departments were taken on the same day. The promo opens with 32 consecutive photos of MPB Today members displaying checks and Walmart cards. The photos appear to have been taken in or around the members’ homes. An image of business titan Warren Buffet is visible on a laptop-computer screen in one of the slides. Buffet is not believed to have any affiliation with MPB Today. Walmart also is believed to have no affiliation with the MLM company. Regardless, images of Buffet and Walmart’s intellectual property have been widely featured in MPB Today promos. The promo is at least the third in which MPB Today affiliates appear to have produced or contributed to sales promos shot in whole or in part on Walmart property. Whether any of the affiliates obtained permission from the company or its employees and customers is unclear. Concerns about privacy also have been raised about Data Network Affiliates (DNA) and Narc That Car/Crowd Sourcing International, two other MLM programs whose affiliates shot promos on properties owned by major U.S. retailers, including Walmart. Both DNA and Narc That Car/Crowd Sourcing International purport to be in the business of paying MLM affiliates to record the license numbers of automobiles. Affiliates of both firms advised incoming members to take photos of license plates or write down license-plate numbers in the parking lots of retail outlets. One promo for DNA recommended that members also record license-plate numbers at doctors’ offices and churches.